This is a dark fairytale about a little girl’s coming-of-age during the Spanish revolution. Ofelia, a young girl who loves fairy tales, is being brought to the country to live with her mother’s new husband, a dark Captain serving with the fascist forces. No sooner is Ofelia in the country, she begins fantasizing she has met a vaguely terrifying faun who sends her on quests. 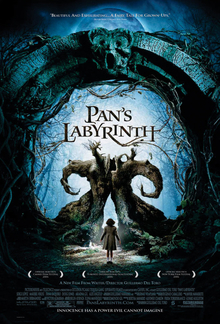 All of the father’s in this movie are evil or weak: the Captain, the faun (I know this is sort of a metaphoric fatherhood role, but I gasped at one point when an imperiled Ofelia nuzzles with the faun, as any child might with a parent), even early on there is a peasant farmer who watches helplessly as the Captain slaughters his son. I found it creepy how Ofelia’s relationship to the faun sort of mirrored her mother’s relationship to the Captain. On one level it seems perfectly normal for Ofelia to imagine a character as dark as the faun, considering how the Captain eagerly risks Carmen’s life. The big hero is Mercedes, a rebel working serreptitiously inside the Captain’s compound. She is not the hero because she is the only one to stand up for Ofelia (although she is), but because she offers a strong contrast to Carmen’s behavior with men for Ofelia. Mercedes righteously stands up for what she believes in, even though doing so puts her life in considerable danger. Ultimately all of Ofelia’s quests can be seen as a way of getting her to think for herself, instead of letting herself be pulled along by mere circumstance, like her mother. In what is arguably the most satisfying decision to rebel since Tom Sawyer chose to go to hell, Ofelia chooses, in the end, to be like Mercedes. I like how ambiguous the story is about whether Ofelia’s fantasy world is real or invented. At the risk of sounding like a kook, I am not so sure I would argue for one or the other, real or imagined. The movie gets a lot of its tension from this ambiguity. But I thought there was a bit too much gore. We get the Captain is an evil man even without all the fake blood. A minor point in what is otherwise a great movie. I really liked the movie, too. My friend took me to it last weekend, and said it was one of several movies he’s seen recently that work with the theme of violence spurring imagination. So it bothered him that Ofelia is never really privy to the violence going on around them, because she was always inside. However, I pointed out that she must have seen quite a few things along the way considering her past and her mother ending up with such a cruel person. Also, she was always on the receiving end of his cruelty in some way. I guess the gore didn’t bother me so much, because the whole movie is very dependent on the visual. So, I wonder if it would have almost seemed funny to be spared those particular details.